The Scorchy Smith collection mentioned in the previous post is now available for pre-order. Meanwhile, Dean Mullaney writes over at the Comic Strip Classics yahoogroup that "my old friend Denis Kitchen is now onboard as a Contributing Editor for the Scorchy book." Another great comic strip, Floyd Gottfredson's Mickey Mouse is apparently also being reprinted. However, unlike other recent comic strip projects, this doesn't seem to be a complete reprint of the strip, but rather a "Best of" collection, probably due in part to racial sensivity issues. For a look at a previous attempt to reprint some of the strips that probably won't be included in this new collection, see Jim Korkis' article about "The Uncensored Mouse". Rumors have been flying for some time about an upcoming Complete Beetle Bailey collection, reprinting Mort Walker's humor strip (I first saw this mentioned in a R. C. Harvey article in The Comics Journal some months ago). Checker Publishing seems to be the likeliest candidate for the American edition, but in the meantime you can see the European edition here. 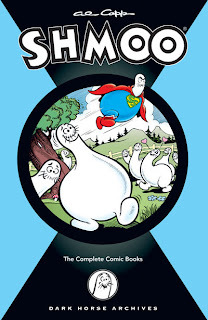 Finally, we have news of another comic strip-related project, this time the 5 issues of the Shmoo comic book, based on the character created by Al Capp in the Li'l Abner strip. Dark Horse has already done some Al Capp collections in the past (four volumes of Sundays done while Frank Frazetta worked as an assistant/ghost artist). While I've read those previous volumes (and most of the compilations published by Kitchen Sink), I know very little about these particular comic books. They're apparently credited to the "Al Capp Studio" rather than to Capp himself, probably indicating that this may be a diluted version of Capp's usual acerbic humor.